We live in Ambridge, PA, with our beautiful daughter Carrie. Alan is a photographer and web designer, and Amy is in the finance department of a company based in Cranberry Township, PA.
We enjoy traveling as much as possible, and we consider cruising to be our favorite form of a vacation. 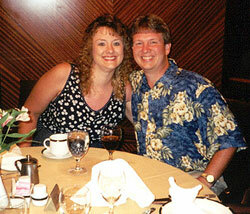 To date we have enjoyed eight cruises, taking us through the Caribbean, Mexican Riviera, Bahamas, Alaska and Hawaii. Alan and Carrie (and Amy, when we twist her arm) are avid Geocachers, taking every opportunity to find a new "treasure" together!